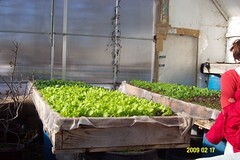 It is that time of year when greenhouses are cranking and seeds are sprouting. Soon the ground will thaw and farmers will head to the fields. Right now most of the work is still indoors. Last week I helped seed onions at Vanguarden and leeks at Brookwood. Beekeeping class at Codman gave me a chance to inhale the rich aroma of manure. Mid-February I visited Natick Organic Community Farm with friends and we admired Natick’s greens. I tried to chat with their pig (she didn’t have much to say). 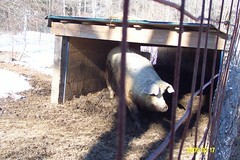 Here are a few photos from my farm visits. More farm visits planned for this next week, too. ← Riverland Farm in the news!